Will Your Center Need an Interpreter in 2017? 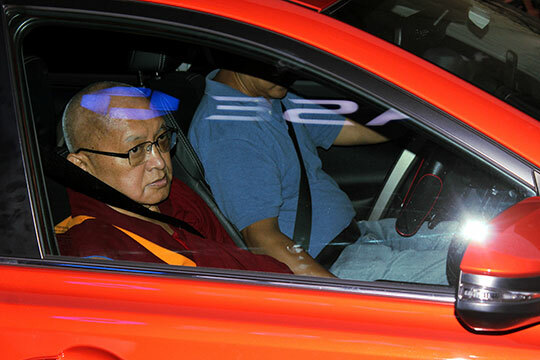 Lama Zopa Rinpoche is sped to a teaching, New York City, USA, July 2016. Photo by Nan Meng. 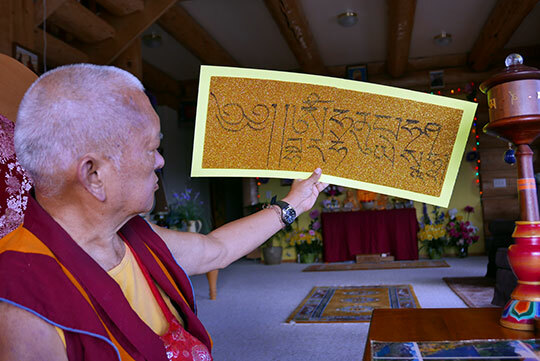 Lama Zopa Rinpoche examines the “Just by Seeing” mantra he has written out, Washington, USA, October 2016. 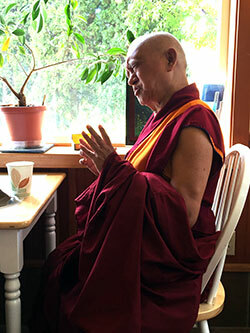 Lama Zopa Rinpoche giving a teaching to two people who came up to meet him in a coffee shop, Washington State, USA, November 2016. Photo by Ven. Roger Kunsang. Lama Zopa Rinpoche recently updated the design of a Samantabhadra protection card for one’s home or office. We’re pleased to make this protection card available as a printable PDF. “Praises to the Twenty-One Taras” is now available as an ebook and includes Tibetan phonetics, chantable English version, and English translation. Living in the Path module “The Happiness of Dharma” has been recently updated with a wonderful video from Ven. Thubten Dondrub. 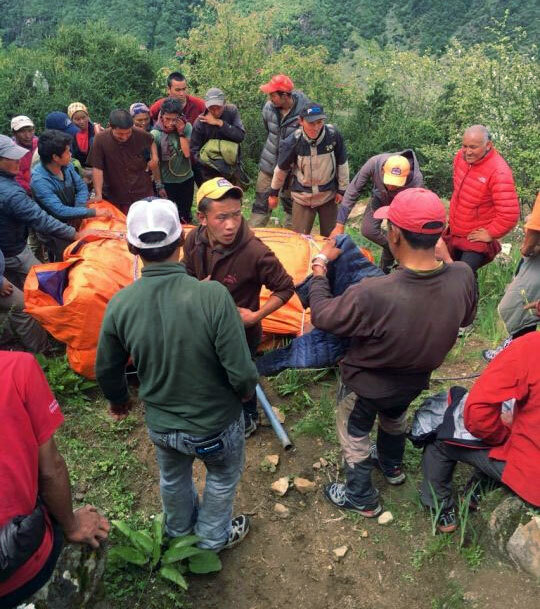 Large Guru Rinpoche statue making the trek up to Lawudo with the help of many. Mandala January-June 2017 is in the mail! This issue’s theme is “How to Practice Dharma.” In it, we explore what it means to really practice Dharma. 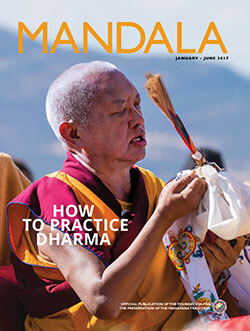 We share Lama Zopa Rinpoche’s advice on meeting hardships on the path from his book How to Practice Dharma. Ven. Gyalten Lekden describes the incredible efforts of Buddhist yogis in their encounters with difficulties. 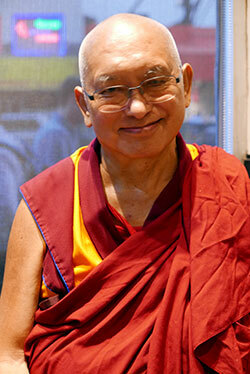 Plus we have teachings from Ribur Rinpoche and Lama Yeshe and stories of practice from several FPMT students. In addition to the print issue, we’ve published several online-only pieces, including a an excerpt about Gelug mahasiddha Gyelwa Ensapa from Jan Willis’s Enlightened Beings: Life Stories from the Ganden Oral Tradition, an interview with Buddhist scholar Roger Jackson, and “Buddha Was a Grassroots Organizer” by Ven. Lozang Yönten. For this and more, see Mandala January-June 2017. For the second consecutive holiday season, FPMT International Office is offering an alternative to giving material gifts. Instead, give a gift that helps others! After you choose one of four FPMT charitable projects to support, you’ll receive an e-card or printed card highlighting the effects of your donation, which you can give to your loved one. We’re sure they’ll rejoice knowing that you chose to make a positive impact for others on their behalf! Learn more and pick your gift. A new Basic Program Online (BP) subject, “Ornament for Clear Realization: Chapter 4” came out this month. All nine BP subjects needed for program completion are now offered on the FPMT Online Learning Center (OLC). With the three-month review and BP final exam also facilitated on the OLC, the option of graduation has become available for BP online students. A major update of the Basic Program materials web page, accessible through the FPMT Affiliates Area, includes many corrected, updated, and new translations, meditations, and transcripts. Check it out! For centers offering BP: please download the list of all available materials with updates indicated. The Masters Program materials web page also includes some new and updated files. Here as well, the materials list indicates all updates. Our new, password-protected Affiliates Area will launch December 5. Look out for your email invitation! The Affiliates Area is an online resource that will replace the FPMT Affiliates Area, and is essentially the FPMT Handbook completely online. The Affiliates Area has been designed to include a powerful search function and intuitive links throughout to make it much easier for you to find the information you need. Yaron Bahir, director of Lotsawa Rinchen Zangpo Translator Program (LRZTP) 7, recently said via the CPMT e-group, “LRZTP 7 has just started the second year of the classroom-based training of interpreters. This means that in less than a year (October 2017), qualified graduates will be ready to come to serve as interpreters for geshes resident in FPMT centers! Don’t miss this opportunity! Contact Yaron now if there is a possibility that your center might need a new interpreter or be able to host a resident geshe next year. 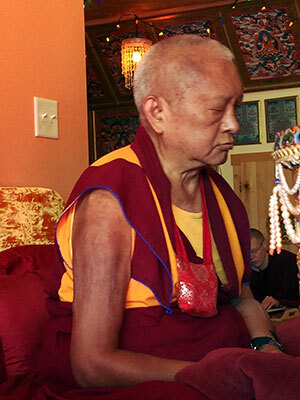 Please see the new section—”Offering Service”—on Lama Zopa Rinpoche’s Advice page for inspiration, advice, and encouragement while offering service to the FPMT organization. We hope you will find many beneficial teachings to support you, your staff, and your volunteers! 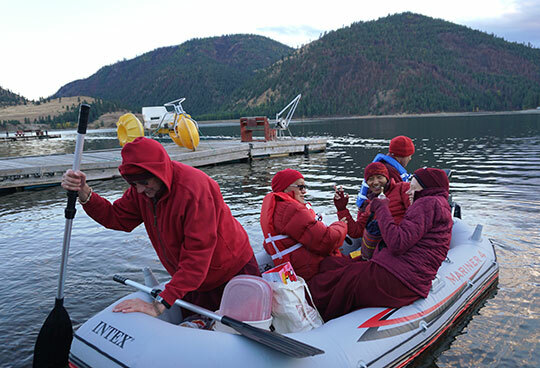 Lama Zopa Rinpoche and entourage blessing Omak Lake with mantras, giving blessed food to the fish, carrying a relic and holy objects, and placing Namgyälma mantras to bless sentient beings in the water, Washington State, USA, November 2016. Photo by Ven. Lobsang Sherab. 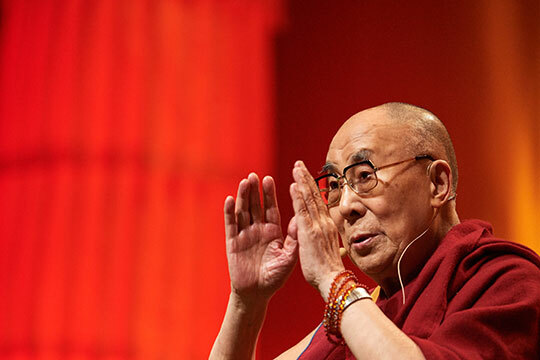 His Holiness the Dalai Lama teaching in Strasbourg, France, September 2016. Photo by Olivier Adam. Click here to register for the FPMT Foundation Service Seminar (with a Facilitator Training component), which is being offered February 3-10, 2017, at Land of Medicine Buddha, California, USA. Root Institute, India, is looking for help in its Project Development and Outreach department; Land of Joy, UK, has various new volunteer positions.